Days are longer, the air is (at least a little) warmer and we’ve likely even seen a few hints at new blossoms—spring is officially here! Some might of even have ushered in this month by pulling a few of our favorite annual pranks. 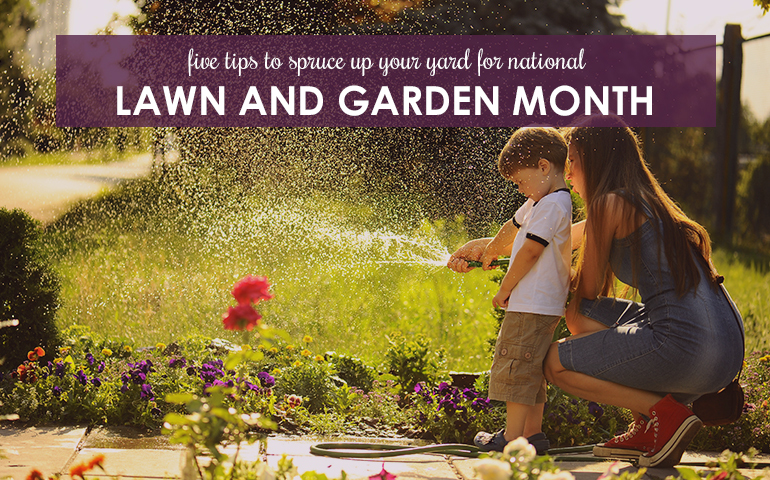 With April’s arrival, we can celebrate another warm-weather tradition—National Lawn and Garden Month! What better way to commemorate this occasion than by getting our yards ready for spring and summer? Winter weather and early spring winds can make quite the mess in your yard. Before you mow or treat your yard for warmer temperatures, be sure to carefully scour it for debris. Look for any loose trash or twigs that might be getting in the way of your greenery. Consider starting a compost pile with the natural extras you find in your yard. While you’re carefully scouring your landscaping looking for twigs and trash, take note of any potential bare spots in your yard too. These areas might need extra attention as you’re prepping your lawn for spring. When you’re ready to spread seed throughout your yard, over-seeding can help give bare spots an opportunity to thrive. 3. Treat weeds before they take over. When spring weather first starts to warm up, take care of potential weeds in your yard. Nipping these unwanted greens early will prevent them from totally taking over your landscaping. Not sure what to feed your lawn to keep weeds away? Test your soil to find out what kind of fertilizer will work best to help your healthy grass grow – and weed out any, well weeds! 4. Perform annual maintenance on your mowing equipment. Depending on how carefully you put away your lawnmower, weed trimmer, and other yard tools at the end of the season last year, now might be the perfect time to give everything a tune-up. Clean your gas- or electric-powered equipment and add any needed oil or fuel. Sharpen blades so you’re giving your yard the very best cut when it is time for the first mow of the season. 5. Focus on the flower beds. It might be a bit early for planting new flowers or shrubs (though we certainly can enjoy the sights of daffodils and cherry blossoms), but now is the perfect time to prepare your flower beds for a showy spring and summer. Get rid of weeds, trim existing bushes and give the beds a fresh edging. Once you’ve got everything finely pruned, add new mulch to give the entire area a whole new look for the season. Get motivated this National Lawn and Garden Month! April’s mild temperatures are the perfect atmosphere for prepping our lawns and gardens for summer. Tackle these five tips to give your yard a great start to the warmer seasons.